A sky diving game where heads roll. Literally. While giving sky diving lessons, instructors should use Jelly Pants' FlyBoy as an example of what not to do, like plunge headfirst into a tunnel full of ancient ruins, or jump through an abandoned mine shaft. Doing this could result in death, particularly when it comes to getting decapitated by a tree branch. Conveniently, the same thing happens in the video game, and that's what makes it so much fun. 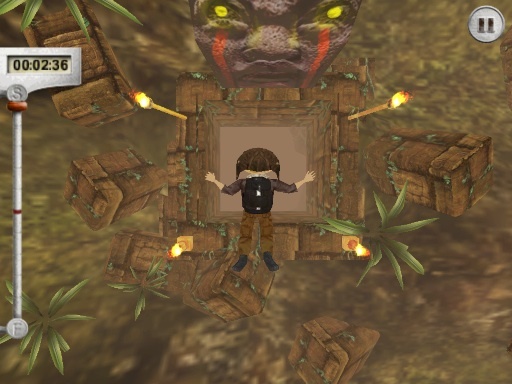 In FlyBoy, the goal is to steer the character through treacherous terrain in the fastest time possible, where doing so results in one to three stars and access to the next level. The tilt controls are easy to get the hang of, as you physically maneuver the iPhone or iPad to skillfully guide this dare devil past a variety of hazards, from tropical birds to wooden beams and lava. Bottom line, you'll need quick moves and smart decision making to complete a stage in one piece. We say "one piece" because you're able to lose limbs and continue playing. With this in mind, the game's much easier to play without legs. You can even navigate a limbless torso. So long as flyboy has a head, he's good to go. With this in mind, the developers littered each stage with power-ups, including first aid kits the regenerate missing limbs, a ghost that makes flyboy temporarily invisible and a rocket that gives him a speed boost. It's definitely a fun way to pass the time, though we wish the game had more content. An endless mode, linked to an online leaderboard, would have raised the appeal, considerably. To that end, Game Center support would be a welcome addition as well. Without these important features, FlyBoy feels a bit empty. We love the concept and the execution, but Jelly Pants would be wise to release an update (or three), especially since it charges iPad users $2.99 for the HD version. 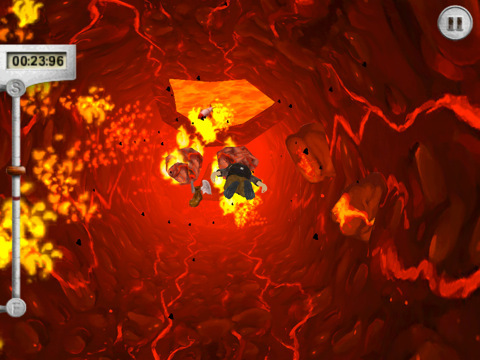 What's Hot: Fun concept, lots of gore, excellent tilt controls. What's Not: Not enough levels, no Game Center or leaderboard support, iPad version costs $2.99.